What is Merlin Salon Management? Merlin is a comprehensive, very robust salon management platform that comes with core functionalities to help you run and grow your salon business, including till management, client management, staff management, marketing, stock and inventory, appointment management, and activity analysis. This salon management software lets you manage your business even if you are not inside your salon. Modern capabilities let you gather and analyze data, such as performance figures, to help you see how your business is performing against industry benchmarks. The Merlin Salon Management software also comes with a service portal that you can access for training, documentation, and over 50 product supplier catalogs. Merlin delivers an integrated salon management solution that simplifies and revolutionizes the way you manage and grow your salon business. The software gives you more control over your till, otherwise known as the cash register. You can open multiple tickets simultaneously or change performers, add or remove a service easily and quickly. The till management feature makes it easy for you to set your payment options and facilitate the payment process. You can arrange for multiple payments, set discount rates, as well as predefined rates. Once the day is done, you can go to your cash register and print reports with detailed statistics for a fast and easy reconciliation of cash, inventory, and more. It is crucial for salon businesses to build strong and fruitful relationships with their clients to usher continued patronage and loyalty. With Merlin, you can create unique profiles per client, complete with their contact details, handling time, Facebook page, purchase and service history among others. These profiles allow you to know your clients better and provide better service as well as deliver convincing and more effective marketing messages. The appointment book feature helps you manage your appointments and reservations. You can view your schedule, your staff’s availability, and your clients’ appointments in a glance, helping you optimize your salon’s performance and increase occupation times. Merlin simplifies employee scheduling and payroll so you won’t have to. The software lets you create employee profiles with all their essential information such as address, phone, email, availability, and commissions. 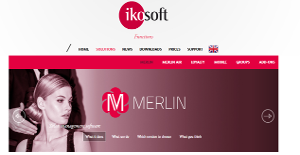 Merlin lets you create control their schedule and be on top of their salary and commissions. You can motivate your staff by defining annual targets and incentivize their involvement in the growth of your salon. If you are interested in Merlin Salon Management it might also be beneficial to investigate other subcategories of Best Salon Software collected in our database of B2B software reviews. Each organization has different requirements and requires an application that can be customized for their size, type of employees and customers, and the specific industry they are in. For these reasons, no software can provide perfect functionality off-the-shelf. When you look for a software app, first be sure what you want it for. Read some Merlin Salon Management reviews and ask yourself do you need basic features or do you need advanced features? Are there any industry-specific functionalities that you are searching for? Find the answers to these queries to aid your search. There are plenty of elements that you need to consider and these include your finances, specific business needs, your organization size, integration needs etc. Take your time, check out a few free trials, and finally zero in on the platform that offers all that you need to improve your firm efficiency and productivity. How Much Does Merlin Salon Management Cost? Merlin’s SMB and enterprise pricing information is available only upon request. Contact the company for more details, and ask for your quote. We realize that when you make a decision to buy Salon Software it’s important not only to see how experts evaluate it in their reviews, but also to find out if the real people and companies that buy it are actually satisfied with the product. That’s why we’ve created our behavior-based Customer Satisfaction Algorithm™ that gathers customer reviews, comments and Merlin Salon Management reviews across a wide range of social media sites. The data is then presented in an easy to digest form showing how many people had positive and negative experience with Merlin Salon Management. With that information at hand you should be equipped to make an informed buying decision that you won’t regret. What are Merlin Salon Management pricing details? What integrations are available for Merlin Salon Management? If you need more information about Merlin Salon Management or you simply have a question let us know what you need and we’ll forward your request directly to the vendor.